Every year, the fashion industry’s insiders descend on the sleepy town of Trieste to search out the next gen of design talents. With past judges including the likes of Gareth Pugh, Isabella Blow, Marina Abramović, Raf Simons and Ari Marcopolous, the International Talent Support competition has an illustrious history, and has seen over 500 finalists pass through its doors en route to starting their own labels and scoring jobs at prestigious fashion houses. 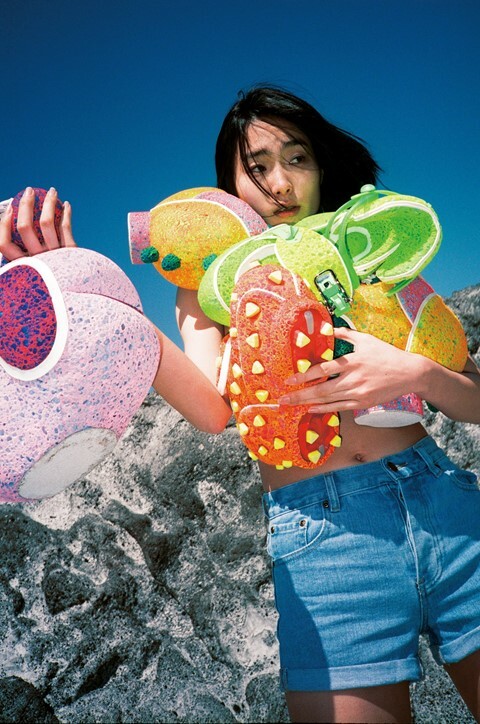 For 2015, young designers and artists from Japan to Estonia were invited to submit work around the theme of The Future, with awards for fashion design, accessories, jewellery and fine art. London won big – with entrants from the city’s best fashion schools – including the RCA, CSM and LCF – making the cut and going on to snag key prizes. While recent London graduates Richard Quinn, Paula Knorr and Quoi Alexander were repping for Womenswear, it was the accessories division where the city's alumni really shone. “With accessories, I think you don't have to think that much about commercialism – you can take risks much much more,” explained juror, Diesel creative director and Dazed alumni Nicola Formichetti of the category – comprising of footwear, bags and millinery and in partnership with fastening company YKK for the tenth year. Sweeping the YKK Fastening Award was LCF’s Bianca Chong, originally from China. With all its pieces able to morph into new forms with the push of a button or the turn of a dial, her collection was inspired by the concept of movement, drawing on old astronomical references. Her winning design, a handbag which employed 3D printing an impressively technical system of gears and bands, transformed the humble zip into a design feature in its own right – when you slid it along the bag, two compartments sprung open. Isabel Helf’s minimalist collection got its start in the designer’s own “compulsive orderliness” – and the fact that a lack of space in London leaves us living in smaller and smaller spaces. Winning the top prize, the ITS Accessories Award, her designs featured wood and leather brought together in functional new ways, with each item perfectly designed to fit its purpose – like the artist’s box with a pop-out shelf containing paints, and another for brushes. Other highlights included Yang Wang, whose space-age accessories were made from wood thousands of years old and traditionally used for coffins, Brit Leo Carlton, who hand stitched fish scales onto his collection, and Begum Yildirim, whose conceptual work used melted glass and metal for pieces inspired by her own experience of reconstructive surgery and our social quest for ideal beauty. Hiroki Kataoka, whose futuristic rainbow sponge shoes were like nothing you’d ever seen before, also scored the Swatch Art Prize for his enormous heart sculpture blending childishness with existential despair. All of the YKK Accessory pieces will be on display in their new Shoreditch showroom, due to open soon. “We joke with the idea of the future because you cannot predict it,” explained the competition’s founder Barbara Franchin. “The only way to predict the future is to build it – we are creating the future; the finalists who compete will be the future.” With designers Peter Pilotto, Astrid Andersen, Demna Gvasalia of VETEMENTS and Björk favourite Maiko Takeda amongst its past finalists, Franchin may just be right.